Edward Moore Kennedy Jr. (born September 26, 1961) is an American lawyer and politician. He is a partner at Epstein Becker & Green, a firm headquartered in New York City, and previously represented Connecticut's 12th Senate district in the Connecticut Senate between 2015 and 2019. He is the son of Senator Edward M. "Ted" Kennedy from Massachusetts and nephew of President John F. Kennedy and Senator Robert F. Kennedy. Ted was born to Edward Moore "Ted" Kennedy Sr. and Joan Bennett Kennedy in Boston, Massachusetts during the Presidency of his uncle John Kennedy. He is the brother of Kara (1960-2011) and Patrick J. Kennedy (born 1967). In 1973, when Kennedy was twelve, osteosarcoma (a form of bone cancer) was diagnosed in his right leg. The leg was surgically amputated on November 17, 1973. On that same day his father had escorted his cousin Kathleen down the aisle at her wedding and rushed back to the hospital. A made-for-TV movie, The Ted Kennedy Jr. Story (1986), concentrated on this event in young Kennedy's life. In 1982, his mother Joan revealed that Kennedy missed by just ten minutes being aboard Air Florida Flight 90, which crashed into the Potomac River on January 13 of that year, killing 74 people. Kennedy was delayed on the drive to the airport and missed the flight. Kennedy graduated from the private St. Albans School in Washington, D.C.. He attended Wesleyan University in Middletown, Connecticut, where he earned a Bachelor of Arts degree in 1984. He continued his studies at Yale University in New Haven, Connecticut, earning a master's degree from the School of Forestry and Environmental Studies. He then attended the University of Connecticut School of Law at night, earning a Juris Doctor degree. On May 19, 2013, Kennedy received an honorary Doctor of Laws degree from the University of New Haven. After graduation he worked at the New Haven law firm Wiggin & Dana specializing in disability issues. He later co-founded and served as president of the Marwood Group, a firm that advises corporations about health care and financial services. He left the Marwood Group in 2014 to join the law firm of Epstein Becker & Green where he advises health care providers, commercial insurers, and life science companies on critical issues related to health care reform policies. Kennedy is on the board of directors of the American Association of People with Disabilities. On April 8, 2014, Kennedy announced his candidacy for a seat in the Connecticut State Senate representing the state's 12th district. He was elected on November 4. He was re-elected on November 8, 2016. On June 26, 2017, Kennedy announced that he would not run for Governor of Connecticut in 2018. On February 28, 2018, Kennedy announced he would not seek re-election to the Connecticut State Senate. On November 6, 2018, Democrat Christine Cohen won the general election to replace Kennedy after defeating Republican Adam Greenberg. She was later sworn in on January 9, 2019. Kennedy was first sworn-in to serve in the Connecticut State Senate on January 7, 2015. On October 10, 1993, he and Katherine Anne "Kiki" Gershman (b. 1959)[verification needed] were married on Block Island, Rhode Island. She is an assistant clinical professor of psychiatry at the Yale School of Medicine at Yale University and an environmental advocate. She serves as spokeswoman for Stop the Pipeline, which successfully blocked the Islander East natural gas pipeline across the Long Island Sound. They live in Branford, Connecticut. The couple have a daughter, Kiley Rose Kennedy (born August 7, 1994, in New Haven), who is a competitive snowboarder and a student at Wesleyan University, and a son, Edward Moore "Teddy" Kennedy III, (born February 25, 1998, in New Haven) who graduated from Choate Rosemary Hall in 2016 and now attends Wesleyan University. Kennedy gave a tribute to his father at his father's public funeral on August 29, 2009. ^ Staff Writer (October 8, 2010).The Doctor's World. New York Times. Accessed March 1st, 2012. ^ Staff Writer (July 29, 2008). Ted Kennedy Jr. Raises Profile Archived 2011-12-14 at the Wayback Machine. The CTMirror. Accessed March 1st 2012. ^ Staff writer (Undated). "Welcome". Marwood Group. Accessed September 1, 2009. ^ Staff writer (Undated). "Marwood Group LLC". BusinessWeek. Accessed September 1, 2009. ^ Staff writer (Undated). "Meet our Board of Directors" Archived 2010-03-16 at the Wayback Machine. American Association of People with Disabilities. Accessed August 31, 2009. ^ Weizel, Richard (April 8, 2014). "Ted Kennedy Jr. announces run for Connecticut state senate seat". Yahoo! News. Retrieved June 26, 2017. ^ "Incumbent Democratic state Sen. Ted Kennedy Jr. wins 12th Senate District". New Haven Register. Nov 8, 2016. Retrieved Jun 26, 2017. ^ Altimari, Daniela (June 26, 2017). "Kennedy Jr. Will Not Run For Governor In 2018". Hartford Courant. ^ Vigdor, Neil (February 28, 2018). "Ted Kennedy Jr. Won't Seek Re-Election To State Senate". Hartford Courant. ^ Staff writer (October 11, 1993). "Weddings; Dr. Gershman, E. M. Kennedy Jr". The New York Times. Accessed August 23, 2009. ^ [verification needed]Film; textual transcript available from main page). portal to The Kennedys - aired on The American Experience on PBS. Accessed August 23, 2009. ^ Staff writer (February 14, 1993). "Engagements; Dr. Gershman, Edward M. Kennedy Jr.". The New York Times. Accessed August 23, 2009. ^ Zaretsky, Mark (December 2, 2008). "High Court Sinks Plan for Natural Gas Pipeline" Archived 2012-09-15 at the Wayback Machine New Haven Register. Accessed Aug. 27, 2009. ^ Russell, Jenna (September 13, 2009). "Son shuns spotlight, but not duty". The Boston Globe. ^ Brozan, Nadine (August 8, 1994). "Chronicle". The New York Times. Accessed August 23, 2009. ^ Video (August 29, 2009). "Kennedy Jr. on His Dad". CBS News's module at YouTube. Accessed September 1, 2009. 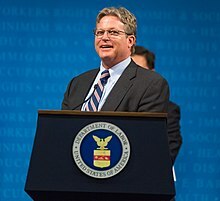 Wikimedia Commons has media related to Edward M. Kennedy Jr.. This page was last edited on 19 February 2019, at 16:49 (UTC).